Find Your Core Values to Rock Your Essay, and Your Future! The 2015-16 Common Application is officially out. If you’re applying to college, you will be making a lot of decisions in upcoming months. Important ones. What schools should you apply to? What should you write your college application essay about so you get accepted? Once you get in, what do you think you will want to study or do in college? Even though I mainly try to help students figure out great topics for their essays, I think all these big decisions have one thing in common: You can help yourself immensely if you take a little time to identify what matters most to you in your life. Most of you have been so busy with homework, and sports and friends these past years, there hasn’t been much time to stop and reflect on yourself, and what you care the most about at this point. It’s not hard to do, and it doesn’t have to take a ton of time. There’s a simple exercise that can help you determine what are called your core values. Once you have a few of these in hand, you might find it much easier to decide where to apply to college, what to write about yourself to help get you into your target schools and even what to study once you get in. You can use your core values to help filter all the options when you make these decisions. First, scan this list of principles, standards and qualities and jot down the ones you really care about (or print out this post and circle them). Then, if you have more than a dozen, notice how some are similar, and narrow it down to about five or so that these few best describe your core values. Shoot for a short list with values that aren’t too similar to each other. Do one or two stand out above the others? Now, when you are exploring potential colleges for your list, or visiting them and starting to apply, go back to these values and make sure those are places that will help you maintain those values. And when you think about what you want to study or major in, or what classes to take, or what activities to pursue in college, make sure those pursuits also support your values. Use Your Core Values to Brainstorm College Application Essay Topics! Pick one of your core values. Now try to brainstorm “a time” when it was challenged or a problem (Hello Common App Prompt 4!). Or “a time” when you developed that value because of your background, talent, identity or interest (Hello Common App Prompt 1!). Or “a time” when you messed up and lost sight of that value (Hello Common App Prompt 2!). These are real-life moments (anecdotes) from your past that you could use to craft a meaningful personal essay, which would have interest and meaning and showcase what you care most about. Those real-life “times” are examples of what matters the most to you. And if you share how you handled that time, you have material for your essay that can reveal your values, and how you think about them and how you act on them when they are challenged, ignored or jeopardized for any reason. I often have my tutoring students start by collecting their defining qualities and work from there to mine great essay topics. But you can also start with one of your core values. The trick to writing a great essay about that value is to find a real-life moment or experience that illustrates not only that value, but how you related to it. Look for “a time” when something happened that related to that value, and then you can share how you thought about it, what you did to handle it and what you learned in the process. Your real-life mini-stories are what will power your essays and make them engaging, unique and memorable. And if they showcase one of your core values, they will have instant relevance and meaning. Best of all, you got yourself an awesome topic! 5 Topic Tips: Do This, Not That! 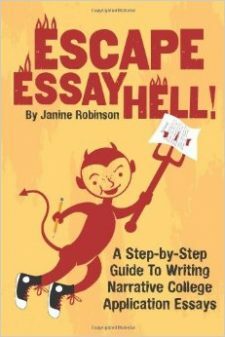 Sample College Application Essays to Inspire You! Should You Write About Your Job? I am VERY impressed with your website. You have some great advice, tips, ideas and presentation! Hope my senior will use it because it’s amazing! Praise given where praise is due!